Every year, thousands of babies leave Asia for foreign lands, boarding planes that will jet them off to new countries, new lives, new futures. Chances of the babies ever re-connecting with their birth families are slim to none, a big plus for many adoptive couples. Considering this, Mei-Ling Hopgood's story really is pretty amazing. It's also funny, poignant and compulsively readable. 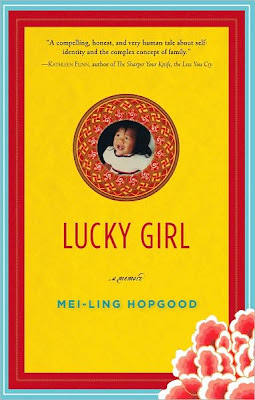 Hopgood, an American journalist who was adopted from Taiwan as a baby, talks about her reunion with her birth family in her memoir Lucky Girl. Raised in Michigan by her loving adoptive parents, Hopgood lived a happy, secure American life. She thought little about her Taiwanese culture or the family who had placed her for adoption. Mei-Ling knew enough - she was born to poor farmers who could barely support the 6 children they already had - to appreciate the good fortune that brought her to middle-class America. She was, indeed, a lucky girl. As she grew up, Mei-Ling faced the kind of identity crisis common to transracial adoptees; by the time she graduated from college, however, she simply viewed her Asian roots with "distance and ambivalence" (119). Little did she know that her past was about to come a whole lot closer, demading anything but ambivalence. A recent college graduate, Hopgood was living in Detroit when she got the phone call that would change her life. On the other end of the line, Chris Hopgood, Mei-Ling's adoptive mother, mentioned that Sister Maureen - the nun who had cared for Mei-Ling after her birthparents placed her in an orphanage - was in town. Chris encouraged her daughter to call their old friend, which she did. An invitation to dinner and an off-hand remark about finding her birthparents later, Mei-Ling realized she had opened Pandora's box. Suddenly, Taiwanese relatives were phoning at all hours of the day, pelting her with questions and requests. The family that abandoned her in an orphanage two decades ago now couldn't leave her alone. In spite of herself, Mei-Ling wanted to meet her birth family. March of 1997 found her embarking on her first trip to Taiwan, a journey that would take her into the heart of a loud, complex family that was, intriguingly, her own. She formed instant bonds with her 5 Taiwanese sisters, who encouraged her to locate another sister who had been adopted by a Swiss couple. Mei-Ling found the sisters engaging with their uproarious, unfiltered personalities. Her birthparents (whom she calls Ma and Ba) were another matter - Ba dominated every gathering with his cantankerous, controlling attitude and Ma let him, much as she had throughout their entire marriage. Language and culture obstructed effective communication, and Mei-Ling struggled to feel close to these parents she never knew. To add to the confusion, she felt a disturbing undercurrent in the family, as if behind their boisterous facade they hid deep, dark secrets. The more Mei-Ling probed, the more she discovered. In the end, she had to decide what to do with this new family and the Asian roots that ran a lot deeper than she'd ever been willing to admit. Like most stories about transracial adoption, this one touches on themes of identity, culture, and family lost and found. The difference is tone - Lucky Girl is upbeat, funny and only a little bitter. While it pays homage to Mei-Ling's close-knit American family, it doesn't discount her Taiwanese relatives, who, despite the horrors of their past, make the effort to reunite their fractured family. Filled with colorful anecdotes and astute observations on transracial adoption, the book makes for an entertaining, but thought-provoking read. The writing could have been tighter, but, all in all, I enjoyed this one. This sounds interesting! I'm intrigued by the author's relationship and issues with her Chinese family. Having a daughter adopted from China, this is probably one book I will want to read one day. Thanks for the indepth review! She was adopted from Taiwan, not China as part of your post states. Taiwan adoptions are very different from China adoptions. Anonymous - Thank you so much for pointing this out. You are absolutely correct - Mei-Ling was adopted from Taiwan. I'm embarrassed about the error, and will fix the review ASAP. Thanks for correcting me! I appreciate it.